Playing guitar scales can be a good way to strengthen your fingers and help familiarize yourself with where the notes fall on your fretboard, but there’s more effective ways to practice playing scales if you want to excel as a player. Playing scales in note order can only take you so far, and if that’s the only way you approach guitar scales practice sessions, you risk finding yourself in a rut. Here are some ways you can practice guitar scales usefully, and in a manner that can improve your playing. Practice playing octaves and alternating the octaves with the notes of a scale in the same position. For instance, play a major scale (or any scale of your choice) in the first position, alternating the notes with their octaves in another position. Difficult but a good way to stretch those fingers. Another approach to scale playing is to work on fluidity using the notes of a scale in more than one position Start in the first position and play the notes as smoothly a possible running up the neck of the guitar. Play the scales forward and backward, using hammer-ons and pull-offs to help facilitate smoother transition. Pay attention to your picking hand while you play. 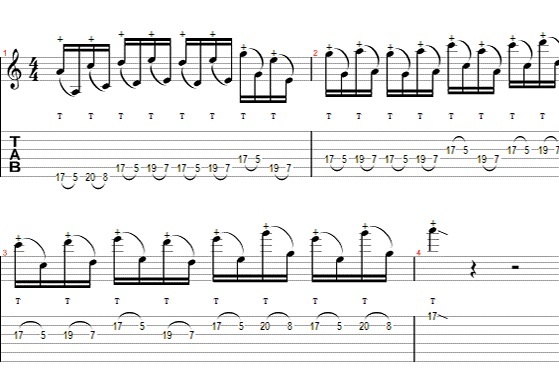 This is a good opportunity to work on speed-picking techniques by alternating changing picking direction with every note. Play 8th or 16th note patterns, start slow, and build your speed up until you can burn through the scale up and down the neck of your guitar (see below). Another way to practice scales is to play them up and down the neck, applying playing techniques to the scale notes as you go. Add some string bending or slides between the notes to give the scale more of a solo feel than a scale. You should also try playing the notes out of order. Getting too accustomed to playing in scale order can get you into bad habits when it comes time to create solos. Training your fingers to play scales like scales can be hard to overcome when you need the ability to combine scales positions and move between them naturally and with ease. Guitar scales practice sessions don’t need to be boring. Stop thinking about the scales as a scale and turn your practice into a series of exercises that will help you develop speed, agility, and a good ear for what goes where.